The University of Connecticut ended its long stewardship of the national traveling championship of women's college basketball, losing to Mississippi State Friday night in the national semifinals. The Bulldogs become the first team to win this championship. 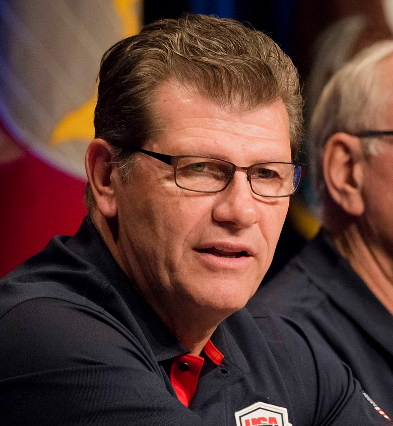 Geno Auriemma coached the University of Connecticut to 73 wins caretaking the national traveling championship in women's college basketball. Now, he can seek his first such title (Chairman of the Joint Chiefs of Staff/public domain image). Nearing two years of following a traveling championship through women's college basketball, we still didn't have a winner. Until Friday night, when Mississippi State shocked Connecticut, 66-64, in overtime, in the national semifinals. The result marks the first actual winning of the national women's college basketball traveling championship since it started being tracked at the start of the 2015-16 season. At that point, as UConn was the defending national champion with 38 straight wins, the Ear of Corn was bestowed provisionally upon the Huskies, to be theirs until someone beat them. And no one could do it for another 73 games. Until Friday night. The Huskies remain the team on top of the all-time traveling championship standings with 73 wins, compared with one for all of the other teams combined. But the Huskies still aren't credited with actually winning the championship, no matter how many times they defended it. To win the championship, one must beat the champion, and that's not how UConn got it. Thus, Mississippi State becomes the all time leader in traveling championships with one. Everyone else has zero. But that can change quickly now. Mississippi State will play next Monday night in the national championship game against South Carolina with the traveling title on the line. And how about Mississippi State? Of the four national traveling championships we have in college sports – two in men's basketball and one each in women's basketball and college football – Mississippi State was the first winner in two of them. But we can't let go of UConn that quickly. What they accomplished as the provisional champions is nearly unheard of in our parallel universe of traveling championships. What follows could more of what is said here, but why say all of that again? Let's say instead that the parallel universe published herein has seldom spun off such a dominating winner in any sport. The only sport with a more impressive run by one team is college football – and we can say that only because we've been tracking college football for 38 years. Miami (FL) held the college football version for 32 straight games – from Oct. 7, 2000 until January 3, 2003. That's more than two calendar years. Southern Cal approached that with 26 straight wins starting on Jan. 4, 2004 and ending on Jan. 4, 2006. With a win in that 45-41 Fiesta Bowl loss to Texas, the Trojans would have cruised past Miami by the calendar year measure. UConn didn't quite make it to two full seasons. But their run compares favorably with others in history. In the NFL, the Green Bay Packers once won 14 straight for the Ear of Corn, which approaches a year's worth of games and comes nowhere near two. It's the best any pro football team has done. Another college football team, Alabama, had a somewhat similar run to UConn's when we initiated the traveling championship for college football in 1979. Alabama was given the title provisionally and defended it for 19 games, a season and a half, before finally losing. Like UConn, the school that took down Alabama for the first championship won on the field was Mississippi State, by a 6-3 score on Nov. 1, 1980, in Starkville. In the pro basketball traveling championship, the Golden State Warriors opened last year with 24 straight wins, a drop less than 30 percent of their season. In the national hockey traveler, the Minnesota Wild had a 12-game winning streak in December. But no other hockey team has managed more than six straight wins in two years. In baseball, the Tampa Bay Rays held the American League version for 13 defenses in 2013. It is a bit different in baseball, because the title changes hands in series, rather than individual games. The Rays were 32-10 during that run of the title. Those 42 games are a nudge more than one-quarter of the season. It is rare for a baseball team in any version of the traveling title to hold one for more than five or six defenses. In two years of soccer in the Americas and Europe, it has been common for teams to mount serious streaks gobbling up around two-thirds of a regular season. Barcelona ran a 17-game winning streak with the ear in La Liga, immediately followed by Real Madrid's 20-game winning streak. Last year, also, Juventus ran a 25-game streak in Serie A and Paris Saint-Germain produced a 27-game winning streak in Ligue 1. It appears, just based on the last two years, that hockey, baseball and pro football are the most difficult sports for long title runs, with soccer and college football making it much more likely and the different levels of men's basketball running somewhere in between. 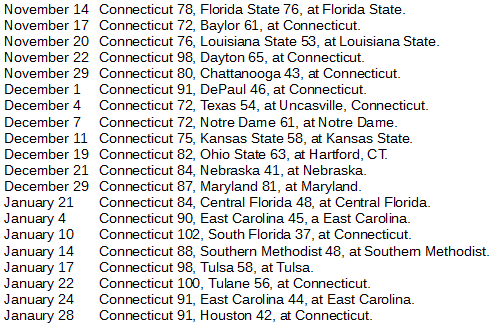 Many downplay Connecticut's dominance, as if it were a stain on women's college basketball that no one else was good enough to end this winning streak. That does seem a little easy. Considerable ingenuity and resources go into women's college basketball. Coaches get paid decent money and players receive scholarships. It's not a pick-up league. Women receive instruction by paid school coaches from at least junior high through high school, participation is high, players learn skills and there has got to be enough highest level talent to make the top four or five programs evenly competitive. That's just eyeballing it. Could be wrong here about how much of that talent exists. But with all the resources and participation in teen-aged basketball, it's too hard to believe that UConn gets all of the players who are capable of winning the national championship, or even the majority of them. It boggles the mind to think no else could gather enough players to just beat UConn in a game. Despite being in the lightly regarded American Conference, the Huskies played 19 games in the last two years against ranked opponents, including three against No. 2 teams and one each against a No. 3 and a No. 4. Do they get more than their share of players? Maybe, but there's still got to be plenty to go around. More likely, though, UConn is that far ahead of the game with the share that it does get. Its achievement should not be under-rated.